If a career with a competitive salary and faster-than-average job growth sounds appealing, check out the field of dental hygiene. Dental hygienists can enter the workforce with as little as a certificate or associate degree, and may choose to work their way up to a master's or doctorate degree in dentistry. In addition to cleaning teeth and examining patients for signs of oral disease, dental hygienists also educate patients to improve and maintain their oral health. Learn more about the path to becoming a dental hygienist and get tips on which features to look for in a dental hygiene program below. 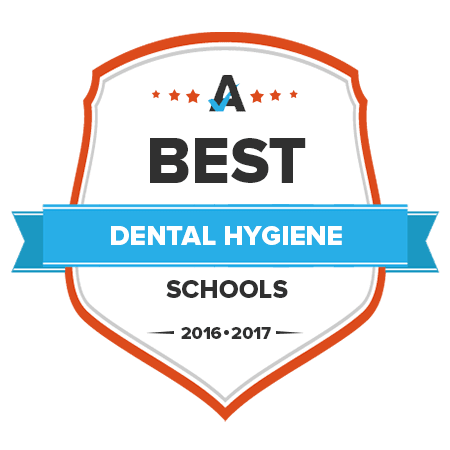 This page includes a breakdown of the different types of hygiene schools and courses, and includes a list of the best dental hygiene programs in the country and a quiz to help determine which is the best route for you. Quiz: Which Path is Right for Me? With new dental hygiene programs popping up all over the nation, it can be hard for students to know which schools offer the best options. Take a look at the list below, which ranks the best schools in the nation based on a variety of factors, and describes some of the top choices to give prospective students a look at top programs at-a-glance. Earn an associate of applied science degree in dental hygiene from Atlanta Technical College through their two year, six semester program and begin working upon graduation. This nationally accredited program teaches students how to perform oral prophylaxis, check for signs of disease in the mouth, head, and neck, perform and develop radiographs, how to educate patients on good oral hygiene, and apply fluoride treatments and sealants in a professional setting such as a private dental practice. The college offers academic advising, tutoring, learning support, and computer lab services. Federal financial aid is available as well as veteran's benefits and scholarship opportunities. Students working toward their associate in science degree in dental hygiene at Blue Grass Community and Technical College of Kentucky work under the supervision of a dentist at an on-site clinic to learn the techniques of this career. The curriculum includes general education courses in addition to those specific to dental hygiene procedures. The clinical experience in conjunction with classroom education, helps students succeed in this demanding profession. The college provides a teaching and learning center, tutoring support, as well as career and job placement services to help students achieve their academic goals. Through the dental hygiene program at Owens Community College in Ohio, students can earn an associate of applied science degree and become eligible to take regional, state, and national exams to become certified. Curriculum provides students with a comprehensive education focusing on preparing them to perform functions such as scaling and polishing teeth, taking and developing x-rays, applying fluoride treatments and sealants, patient education, and teaching oral hygiene techniques. With an on-campus child care center, fitness center, and many other activities, students stay engaged in campus life. They also offer guidance counseling, career coaching, as well as scholarships and financial aid. Adults interested in a dental hygienist career could earn a diploma in two semesters at Western Iowa Tech Community College. Classroom training isn't all that is required to graduate with the diploma. Students must keep at least a 2.0 GPA. The minimum GPA is needed in dental hygiene courses and electives. To graduate, students must also complete clinical and laboratory training. At the end of the program, students qualify to sit for the Dental Assisting National Board Examination. If they pass the exam, they receive a national dental assistant certification. Depending on the state that they practice dental hygiene in, passing the exam may also help students to meet state board licensing or certification criteria. A goal of Moreno Valley College's Associate in Science in Dental Hygiene degree is to prepare students to enter the healthcare profession as dental assistants. Graduates of the program are also taught about health promotion, patient care and how to use dental equipment. At the end of the first year of school, students can sit for the National Dental Hygiene Board exam. Passing the exam can help students to meet state licensing board requirements. Annually, about 20 students are enrolled in the two year training. The program is segmented into fall and spring semesters, one summer session and winter sessions. Truckee Meadows Community College's dental hygiene training can be completed in two years. The school takes a tri-learning approach. Instruction is delivered in the classroom, in a clinical setting and in a laboratory. Enrollment maximizes at about 14 students a year, because the college wants classes to remain small. Applications are accepted until February. Adults who earn high scores on the Accuplacer exam could increase their chances of getting accepted into the program. Prospective students can meet with college and dental hygiene administrators during an information night, an event that precedes the start of classes. Classes that lead to Central Community College's Associate of Science in Dental Hygiene degree are taught at the school's Hastings campus. In addition to lectures and written assignments, students practice what they learn in an actual laboratory. Practical experience is realized in a supervised 15-chair dental clinic. Prerequisites in subjects like microbiology, sociology and psychology are required to start classes. Additionally, vaccinations, passing college entrance exam scores and a minimum 2.0 GPA in-non prerequisite courses are needed to get admitted into the program. Training to enter a dental hygienist career is available through Pasadena City College's Dental Hygiene Associate in Science degree. Prerequisites cover math, communications, nutrition, psychology and sociology. The college posts course schedules in its WebCMS system. Places where graduates could work include community clinics, schools, hospitals and private dental offices. Pasadena City College also offers a certificate dental hygiene program. Students who attend class full-time can typically graduate with their degree in two years. Both the two-year and the certificate program are accredited by the American Dental Association and the Commission on Dental Accreditation. Classes for Wallace State Community College's Associate in Applied Science in Dental Hygiene are intentionally kept small. Adults interested in earning the degree are encouraged to attend the college's dental hygiene information session. During information sessions, students learn about specific prerequisites associated with the program. Reservations are required to attend the sessions. Skills that adults gain during the associate degree program teach them how to exam teeth, including dentures. Students also gain skills to clean teeth, develop x-rays and perform minor dental treatments. Oral pathology, clinical dental hygiene and dental radiology are types of courses that instructors teach. An Associate in Applied Science in Dental Hygiene is offered at the Tulsa Community College Metro campus. Classes are held each year. But, generally only 14 students are allowed to attend the classes annually. Graduating from the program prepares adults to educate the public on how to prevent gum diseases and tooth decay. Graduates of the program also learn how to use laboratory equipment and syringes and perform CPR. It's important that applicants are community members in good standing, as legal convictions and health field suspensions could hamper chances of being accepted into the degree program. Ability to pass the Western Regional Examining Board and the National Dental Hygiene Board tests are benefits associated with the University of Alaska Fairbanks' Associate of Applied Science in Dental Hygiene degree. The school operates a dental hygiene clinic that students can practice in. Core curriculum subjects include pharmacology, pathology of oral tissues, oral pain and principals of dental health. A clinical practicum and a clinical seminar are held during the latter semesters. Grades in core dental hygiene classes cannot drop below 75 percent. An academic advisor is available to help full-time students develop a schedule that keeps them on track to graduate within two years. Dental hygienists work under the supervision of licensed dentists. Idaho State University's four year dental hygienist degree instructs students on basic and complex skills and knowledge needed in the healthcare field. Freshman and transfer students are accepted. The Bachelor of Science in Dental Hygiene degree provides adults with soft and technical skills. Among these skills are community disease prevention, tooth morphology, dental materials, leadership and health policy and oral pathology. During clinical sessions, students learn how to perform root planting, apply fluoride therapy and develop x-rays. Opportunity to get advanced training is offered through the school's Master of Science in Dental Hygiene program. The Bachelor of Science in Dental Hygiene is the more advanced of two dental hygiene degrees offered at New York University. The school based in the Northeast also offers students the chance to earn a 17 month fast track Associate in Applied Science in Dental Hygiene degree. A minimum of 128 credits are needed to finish the bachelor degree. Under Track A, students get their basic dental hygiene foundation and their advanced training at New York University. The accelerated Track A option accepts some transfer credits, allowing students to graduate sooner. Under Track B, students are allowed to complete their entire two year training at the university or another accredited school. Courses adhere to technical and health standards. Prerequisites are required to start the trainings. Throughout the year, New York University hosts healthcare and informational sessions that are related to the dental programs. Lake Washington Institute of Technology adheres to a competitive admissions process as it regards selecting students for its dental hygiene program. Adults interested in the program should review and complete prerequisite courses early. Deadline for fall classes is as soon as March. Information sessions are available. During these sessions, the school provides details on the application process and fields applicant questions. Clinical and laboratory training occur at the institute's on campus clinic, a facility that is designed with individual dental stations. Students also complete clinical training at approved medical facilities in Seattle. Students who successfully complete the program receive an Associate of Applied Science in Dental Hygiene. Adults who are accepted into the Associate of Science in Dental Hygiene program at Eastern Florida State College acquire dental hygiene skills in an on-site laboratory. The laboratory resembles an actual dental clinic. Classroom learning teaches students about topics such as oral pathology, pain control, chemistry and periodontology. An admissions counselor or academic advisor lets students know if they need to take developmental or prerequisite courses before they start taking degree specific classes. Real life procedures that students perform in the laboratory include teeth cleaning, applying antibiotics and developing radiographs. All students seeking a bachelor degree in dental hygiene at the University of Maine at Augusta are required to meet with an advisor before classes start. Instructors teach students about dental hygiene topics like oral health nutrition, dental radiology and community dentistry. Techniques to reduce patient anxiety and pain before and after they receive dental procedures are other skills that instructors offer students. During the second and third year of courses, students must attend classes every weekday in person. A background check, up-to-date immunization record and a CPR certification must be submitted with new student applications. The College of Southern Nevada confers two undergraduate dental hygiene degrees. Both the Associate of Science in Dental Hygiene and the Bachelor of Science in Dental Hygiene prepare adults to enter careers as dental hygienists. Training in the bachelor program combines clinical, classroom and field experience. Although students can transfer from the associate program into the bachelor degree option, the school also accepts transfers from other accredited institutions. Out-of-state students are also accepted. The Northwest Commission of Colleges and Universities accredits the bachelor degree program. Students who complete their associate training at the school are expected to earn state and national certifications before they pursue the bachelor degree. Classroom courses are only a portion of the University of Southern Indiana's Bachelor of Science in Dental Hygiene curriculum. Clinical and laboratory training is also provided. Classes sizes are small. A true test of what students learn occurs in real life dental care settings during community dental health sessions. These sessions take place at the university's onsite dental clinic. To broaden their learning, students can also get a certificate in dental assisting or local anesthesia for dental hygienists. Credits from certificate programs may be transferrable into the four-year option. At Broward College, there are three paths to gain a dental hygiene education. Shortest of the three programs is the Applied Technical Diploma in Dental Assisting. Time commitment required to complete this program is 12 months for full-time students. The two other paths lead to an associate degree. There is the Associate in Science in Dental Assisting and the Associate in Science in Dental Hygiene. For all three paths, clinical training is provided at the Broward Dental Research Clinic. The clinic was established in 1975 and offers students the chance to experience performing dental procedures in real time. Thinking about how to pay for dental hygiene school? This list of scholarship, financial aid and loan repayment opportunities pinpoints programs for dental hygiene students specifically. From student wellness to networking, this collection of resources can help students stand out and get ahead while still in dental hygiene school. Whether coming from another field or getting your first degree, learn how and what dental hygienists are doing to advance their careers. This first real homework for prospective students is to find dental hygiene programs that meet their individual needs. For many, locating a school near work or home is the primary consideration. Other key factors may include career goals, curriculum, the length of a program, credits required for graduation and tuition costs. Cut through the clutter and save time using this search tool to locate the right dental hygiene program. Dental hygienists are a fundamental part of medical care. They play a major role in dentistry, removing stains, tartar and plaque from patients’ teeth, as well as applying fluorides to protect them. Attending dental hygienist school is essential in order to pursue this career, as these professionals are required to pass stringent licensing requirements. Programs can be found at vocational schools, community colleges and universities. Vocational schools are dedicated to providing students with the practical training they need to enter the dental hygiene field as soon as they're finished earning their certificate. In order to ensure that students have as many marketable skills as possible, these programs allow them to work in a dental clinic at the school or directly at a local dental office. Students in these programs may also have the opportunity to earn a certification in CPR. Community colleges also give dental hygiene students first-hand experience with the work they will perform when they begin employment in the field. However, the degree programs students will find at these schools offer a more well-rounded education, as students are also required to take some general education courses, like public speaking and English composition, in addition to their dental hygiene curriculum. Four-year college programs generally require that students have already attended dental hygienist school before they enroll in a bachelor's degree. These schools are for students to wish to take their education and experience to the next level, and they provide first-hand experience in addition to more in-depth education that enhances a professional's career. Students enrolled in 4-year schools are required to take more general education courses than community colleges require, which can include general science classes like biology and chemistry. Degree programs for hygienists found at dental schools are generally more detailed than the ones at non-dental schools. While community colleges and 4-year schools put a lot of focus on general education, dental schools give students much more exposure to the science and practice associated with the healthcare industry. In addition to learning more about the day-to-day duties of a dental hygienist, students in these schools learn about healthcare ethics, research and managerial concerns, which can better prepare them for career advancement. There are many institutions in which students can learn the tricks of the trade of becoming a dental hygienist. However, in order to get the most out of their education, a student should put a lot of thought into which dental hygienist school is the right fit for them. Keeping the following criteria in mind can help a prospective student make an informed, well-researched decision. First and foremost, students must pick a school that's going to prepare them for the licensing examination in their state. In order to do that, the school they choose must be accredited by The Commission on Dental Accreditation, which is part of the American Dental Association. This will guarantee access to the highest education standards and the best chance of obtaining the license needed to get a job in the field. To help narrow their options, students may want to ask every school they’re interested in how many students have passed the licensing examination on the first try. All dental hygienist schools have a clinical element to their curriculum. Students should try to look for schools that give them as much clinical experience as possible. A dental laboratory on site is an excellent sign that students will be able to obtain the level of hands-on experience they need to work in the field. Additionally, some schools have partnerships with local dental offices, allowing students to get real-world, in-office clinical practice. When choosing a school, students should look at the educational options through the lens of what their career goals. For example, students who want to eventually go on to teach other dental hygienists should search for a program that has coursework designed to facilitate careers in dental education. Students interested in conducting research should look for a program that will teach them about the most current research in the field, as well as how to conduct their own original research projects. Students looking to immediately begin their careers post-school should look for an institution that offers an accelerated degree program focused strictly on the work of a dental hygienist, providing as much hands-on experience as possible. Those who want to get a broader education may consider schools that have a more liberal-arts-based curriculum, which allows them to gain the clinical education they need while helping them enhance other important skills, such as math or communication. I would highly recommend someone job shadow first to see if the career and specialization interests you. Also, think about if you have an interest in science and relate well with people. Finally, don't be afraid to ask questions. There are several different educational pathways students can consider to become a dental hygienist. Assess priorities—if starting a career as soon as possible is important, a certificate or associate degree program may be a good fit. An advanced degree, which takes longer to complete, may provide more career opportunities, but will also take more time. Regardless of the education level a student chooses, it is important to select a program accredited by the Commission on Dental Accreditation (CODA) because only graduates of accredited programs are eligible for dental hygiene licensure. Quiz: Which Dental Hygiene Degree is Right for Me? When considering the dental hygiene programs available, several factors will impact a student’s decision. For some, cost may be the most important consideration while others may focus on the long-term job opportunities available with more advanced degrees. This quiz helps students pick a pathway, with questions that help break down degrees relative to student needs. Get started to see which degree path may be the best fit. As supporting staff in a dentist’s office. As manager of a dental office or corporate administrator. As a dentist, dental researcher or dental professor. Any role in a dental office, I’m not picky. Flexibility is important, including per diem or part-time options. A full-time position with regular office hours would be ideal. Full-time with a certain amount of flexibility. Any amount of hours, not necessarily always in an office or dental practice. Patients and other office staff. Patients in either a clinical or customer service capacity. Working in a dental office with some experience. Starting my career as a practice administrator or managing a dental office. Finishing a research project for my advanced degree. Working as a dental hygienist with several years of experience. Overall value – affordability with a good salary to look forward to after graduation. Loans and scholarships are available to me so I can afford to spend more money and time completing my degree. I’m willing to invest more now if it means a higher salary and more career options after graduation. Cost is my top priority; I want to finish school quickly to reduce my amount of possible debt. Students applying to high-level dental hygiene programs above a certificate or associate level program are expected to fulfil certain requirements and supply various application materials. This gives a school a sense of who the applicant is and whether or not they would succeed in a particular dental hygiene degree program. Some application requirements also test an applicant’s commitment to the industry and current experience. Here are some common requirements applicants should be prepared for. Students should complete general education classes before applying to higher degree programs in dental hygiene. These classes are typically introductory science and math classes as well as classes in English. Master’s programs almost always require a completed bachelor’s degree, preferably in dental hygiene. Higher-level degrees may require previous work in a dental office as well as an associate degree or certificate and a license to practice. Most programs also require that applicants shadow a dental hygienist at work for a certain number of hours. Most high-level dentistry programs require applicants to take the Dental Admissions Test, administered by the Commission on Dental Accreditation. This exam tests a student’s aptitude in aspects of dental hygiene. Students should have any previous college send over transcripts; the documents are not considered official if sent by the student. Previous professors or employers should write recommendation letters supporting an applicant and highlighting the qualities that would make them a good fit for the program. While applications for programs may vary, if the programs do not accept the ADEA’s Associated American Dental Schools Application Service (AADSAS), applicants can expect to provide biographical information, socioeconomic data and a personal statement in most applications. There may also be an application fee, depending on the program. There are several degree options for students who want to enter the field of dental hygiene. Students interested in fast-tracking their career can earn a certificate at a trade school, taking roughly one year to completion. Those who want to get an intensive, yet well-rounded educational experience may consider getting an associate or bachelor’s degree. Although the coursework for these programs varies from school to school, they typically require students take general education courses in addition to their dental hygiene workload. Students looking to advance in their careers may consider getting a master’s degree, where they can get more in-depth knowledge of dental hygiene and learn about a specific concentration, such as public health or education, which will allow them to achieve specific career goals. An associate degree in dental hygienist blends clinical and academic coursework to prepare students for jobs in dental offices, schools, hospitals and other medical facilities. These programs are often found at community colleges and grant an Associate of Science degree that can be completed in approximately two years. This course teaches students about the anatomy and physiology of the head and neck. Course topics include the human skull, oral cavity, bones found in the head and neck and how to identify different kinds of teeth. Students learn about the different types of dental laboratory materials, as well as the properties of these materials, such as bonding agents and cements. Students receive detailed instructions on how to prepare, mix and use these materials on patients in an efficient and safe manner. This course gives students an understanding of anatomy and physiology, including medical terminology related to different parts of the body. Class topics include cell and tissue structures; the nervous, skeletal and circulatory systems of the body; and human pathology. Students in this course are given both a broad view of radiology, as well as how radiology applies to the dental hygiene field. Course topics include infection control; safety techniques; the health problems that radiation exposure can cause in patients; and how to expose and evaluate dental radiographs. This class provides an overview of the oral health profession, including the history of the field and terminology used in practice. Covered topics are the examination of the relationship between nutrition and dental health, the ethics of the workplace, preventive techniques and how to maintain professionalism when working with patients. Students learn the practices of chair-side dental assisting, including the equipment that is used in a dental office. Topics covered in the class include infection control, ergonomic body positioning, dental dams and cements, pain control and tissue retraction. This course generally has a lab component. A Bachelor of Science degree focuses on dental hygiene studies, as well as general education. These degrees generally take four years to complete and admissions requirements include earning an associate’s degree or certificate in dental hygiene or completion of prerequisite classes. Students can expect to gain a deeper understanding of the field, while cultivating important research, critical thinking, writing and communication skills. This course explores the legal and ethical challenges that occur in a dental practice, as well as how to adhere to applicable legislation and maintain high work standards. Course topics include the laws that govern the healthcare field and the standards that are expected from people working in the dental hygiene profession. Knowing clinical procedures is just part of the equation of becoming a good dental hygienist. This class teaches students how to work effectively and efficiently in a dental team environment. Emphasis is placed on communication skills, managerial practices and patient management techniques. This course teaches students research design and the process involved in conducting dental hygiene studies. In addition, this course gives students the ability to look at existing research with a critical eye, identifying the strengths and weaknesses of the protocols used in clinical studies. Students receive an overview of the periodontium, or the tissues that support the teeth. Students learn about the periodontium’s anatomy and physiology, as well as how periodontal diseases are diagnosed and treated. Advanced clinical concepts aims to broaden the knowledge base of students, giving them an understanding of advanced clinical procedures and evidence-based research. Topics may include pain management, periodontology, oral medicine and technologies used by dental hygienists. This course covers the drugs that are used to treat dental patients. Class topics include the dosages, side effects, chemical properties and therapeutic benefits of different drugs that are prescribed in dental practice. Professionals who would like to advance their education and careers can earn a Master of Science degree in dental hygiene. These programs prepare students for roles as educators, researchers and health administrators. Though every program will have different standards, common admissions requirements include completion of a bachelor's degree, an interview with admissions, a minimum amount of clinical practice done and completion of prerequisite courses. This course gives students a step-by-step illustration of the process of writing a grant proposal or contract for state, federal and funding sources. Specifically, students will learn about the types of grants and contracts available, how to complete an application for these awards and how to manage funds once awards are granted. The aim of this course is to prepare students to teach dental hygiene courses at the undergraduate level. Topics include curriculum design, teaching strategies, evaluation techniques and the differences between teaching a course online vs in a traditional classroom. Designed for students who want to prepare to take a managerial role in a healthcare facility, the focus of the course includes subjects such as leadership styles, fundamentals of organizational communication and how to apply leadership theories to a dental hygiene practice. Students will be introduced to statistical analysis and how it applies to issues in dentistry. They learn about the research process and what is involved in conducting their own studies. Students who want to study dental diseases in a population can take this class. Topics covered include public health, clinical research and dental hygiene scientific literature. Students interested in working for public health agencies and nonprofit organizations may take this class to learn about how to educate a community about dental health. How to craft a public health campaign and understand the health needs of the community are among the topics covered in this course. Accelerated bachelor’s degree, dual degree and bachelor’s completion programs provide fast-track pathways to speed aspiring dental hygienist into the profession. Offered in campus-based or online formats, these academic degree programs are designed for students that are dedicated to learning and combine classroom instruction with laboratory and clinical practice. Online accelerated dental hygiene programs are ideally suited for students with work, family or other commitments that want to advance in the field. Clinical requirements may be met at campus simulation labs or at partnering local facilities convenient to online students. Coursework is tailored specifically to dental hygiene curriculum, minimizing the total number studies required outside the major field of study. Who is a good candidate for an accelerated dental hygiene program? These accelerated dental hygiene programs are not for everyone. They may interfere with the time students spend with family and friends, and working students with family obligations may find an accelerated program difficult because of the rigorous schedule. But for students who can manage time and dedicate themselves to a more intensive college routine, accelerated degree programs provide an education that builds credentials and expertise in the shortest time of completion. Take an honest look at the considerations below to see if an accelerated program is a good fit. While online accelerated dental programs provide convenience, students must complete assignments and simulation laboratories with systematic progress. Each student must discover their own way to remain focused despite outside distractions. Can you combine college with a full-time job? Not all employers provide enthusiastic support for working dental students. Students must demonstrate their ability to juggle job commitments with their temptation to work on their degree, which can increase stress levels and impact performance. Most students find it easy to bond with peers in their dental hygiene programs, forming study groups online or at clinical sites. In order to thrive, it’s important for students to have an emotional support network of friends and family who understand the challenges of an intense accelerated schedule. Do you have basic tech savvy? Instruction modalities in accelerated dental hygiene programs can include streaming lectures, CD learning, online examinations and chat and online collaboration tools. In addition, students may use mobile apps for study guides and note-taking, with free online resources such as Medscape, Dentistry Pro-consult or 3D Dentist. Simply taking courses toward a degree or certificate is not enough to get on the right track toward having a successful career in dental hygiene. The following are examples of tools that students need to use – in conjunction with their educations – in order to finish school and become a successful dental hygienist. Dental hygienists need to work alongside dentists and other assistants, and in order to be successful, they need to effectively work in a team environment. Dental hygienist schools give students necessary hands-on experience, where they can develop and demonstrate these skills. The more they are able to learn to effectively work well with others, the more successful they will be. Hygienists have an important role in any dental practice, so it's imperative that they understand the clinical procedures necessary to perform their jobs. Students must understand the biology of teeth, as well as the equipment they will use to help dentists treat their patients. Without both the clinical skills and academic knowledge, students are unlikely to be successful in their degree programs. In order to pass the licensing examination, students must be able to demonstrate that they can perform the job in the real world. That's why it's important for students to get the hands-on learning they need through dental clinics at their schools, as well as taking advantage of any opportunities to work in a dental practice. Good communication skills are paramount to finishing a dental hygienist degree. Students must have exceptional listening skills, not only in the classroom, but also when taking instruction during their clinical training. One mistake on a patient can have huge ramifications. In addition, students must also possess excellent speaking skills, so they can communicate effectively with their team, conveying the information other professionals need to know. Success in any degree program counts on the effective demonstration of communication skills. Students must be able to demonstrate that they can use the concepts they learned in their textbooks and apply them to in real practice. In order to do this, they must have strong critical thinking skills and demonstrate the ability to think fast and on their feet to solve problems that may arise when treating a patient. The National Board Dental Hygiene Examination (NBDHE) is the standard assessment tool for state dental boards. Graduates of dental hygiene programs must successfully complete licensing exams in the state in which they will practice and the NBDHE is a component of meeting those licensure requirements. After completing the NBDHE, candidates must take and pass state-specific clinic examination. These exams vary by state so it is important to not only prepare for the National Board exam, but understand any additional testing needed for licensure at a state or regional level. NBDHE results are currently recognized by all United States licensing jurisdictions. The exam has two components – Component A is discipline-based and Component B includes case-based items. Exam results are typically made available three to four weeks after the testing appointment. Allow 9 hours for the National Board Dental Hygiene Examination – 3.5 hours is allotted for discipline-based items and 4 hours is allowed for patient case items. A break is scheduled, as well as an optional tutorial prior to the exam and an optional post-exam survey. You must obtain your DENTPIN (Dental Personal Identification Number) prior to beginning the NBDHE application process. The examination fee is $400 but candidates who are students or graduates from a non-CODA accredited program must pay an additional $125. Obtain your DENTPIN. You must have this to begin the application process. Submit your application to take the examination. Once your application is processed by the JCNDE, you are eligible to take examination for a six-month period. If you do not schedule your exam during this time period, a new application and fee must be submitted. Review the tutorial available from Pearson VUE. On the day of your scheduled exam, you will be able to take a brief optional tutorial before beginning the examination. On the day of the examination, arrive at the testing center at least 30 minutes prior to the start of the exam with two original, current forms of identification. To be as prepared as possible for the NBDHE, students have many options to help study up. Here are some examples of online exam prep resources for dental hygiene students. The American Dental Association offers this sample test for students studying for the NDHBE. The formatting and questions listed are similar to those on the actual National Board of Dental Hygiene Examination. This online tool provides detailed explanations of commonly tested facts and practice exams that not only allow candidates to preview possible exam questions but also become familiar with the exam format. Developed by a Dental Hygiene Education Consultant, students can access a collection of sample cases to assist with studying for the case-based portion of the NBDHE. The site creator also has a Facebook page providing additional resources for exam candidates. Debbie Bishop, a dental hygienist at Brady Dental Care, discussed with us and shares her experiences as a student of a dental hygiene program. What made you decide to earn a dental hygienist degree? I was heading to law school, or so I thought. I worked a year for an attorney and hated it, so I went to a trade school to take an aptitude test and it showed an aptitude for science. They had a dental assisting program, but when I met with the department head, she encouraged me to go into hygiene instead. Therefore, I headed to Wichita State University and was accepted into their hygiene program. I enjoyed the small size of our classes and individual attention by professors. We had no more than 30 in our class, so any questions I had were quickly dealt with. Additionally, we had a relationship with the professors, instead of being number 48 in a class of 300 or so. Our group of 30 girls became very close over the course of two years, and I still maintain many of those relationships 34 years later. What was the most challenging thing about the degree program? I actually felt very prepared by my education, but when it came time to prepare for boards, I remember being a bit overwhelmed with the amount of knowledge we had to retain and prepare for. It was also a little scary to think of seeing eight to 10 patients in a day when we were used to no more than three in a day. Talking to our instructors who were hygienists or dentists themselves helped in that matter; they assured me I would do fine once I got into a practice. How do you feel the degree program prepared you for your career? I feel WSU prepared me well with lots of good clinical practice and time. The program covered everything I needed to practice hygiene; not only "book learning," but practical ways of dealing with people as well. Also, our instructors encouraged us to keep their numbers handy if we needed to talk to them after we graduated and were in practice.